John Charles Fremont was born in Savannah, Georgia on January 31, 1813. As a youth, Fremont attended school in Charleston, South Carolina. He entered preparatory school when he was fourteen, then entered Charleston College, but left after a brief stay. For the next twenty years or so, Fremont led the life of an adventurer, traveler, explorer, map maker, and soldier. Even his first job, as a teacher in 1833, was unusual. He was employed to teach mathematics to the midshipmen aboard the USS Natchez, a war sloop on a two-year cruise to South America. By 1836, Fremont had returned to the U.S. and became employed as a surveyor, plotting railway routes in Carolina and Tennessee. In 1837, he was busy surveying Cherokee lands in Georgia. The U.S. Topographical Corps. commissioned Second Lieutenant John Fremont in 1838. Fremont wanted to explore, and he especially wanted to explore the Rockies. He got government backing and in 1842 he started on a series of explorations throughout the western U.S., the Rockies, and territory not yet a part of the U.S. He explored the South Pass, along the route that would become the Oregon Trail. Fremont's reports of his explorations included not only the geography and layout of the land, but also included descriptions of strategic locations, botanical notes, and geological observations. Congress and the public enthusiastically read his accounts, and Congress ordered the printing of thousands of copies of Fremont's reports. His expeditions continued, taking him through thousands of miles of the country's wilderness. He traveled the mountains, valleys, and rivers of the largely uncharted West, through Oregon, California, Utah, and New Mexico. He documented some of the least-known places in the West, like Great Salt Lake, Alta California and its basin. He met with explorers, soldiers, presidents, and Indians. He knew the likes of Kit Carson. He led his expeditions through the Rockies, and into the Sierra Nevadas. Fremont was promoted to captain in 1844. As captain, Fremont led a regiment into California as the Mexican War loomed on the horizon. In 1845, Fremont rallyed the settlers in California to stand up against Mexican rule. This resistance was the beginning of an independent California republic, and is sometimes called the Bear Flag Revolt. The rebellious settlers gathered on June 14, 1846 in the plaza of Sonoma, California and forced the Mexican Colonel Vallejo to surrender. In celebration of their bloodless victory, the rebels raised a flag bearing their emblem: a brown bear on a white field, a red stripe along the bottom and a red star in the upper corner, and the words "California Republic". Fremont was headed for trouble, though. Caught in the middle of a brewing dispute over the command authority of military leaders Commodore Robert Stockton and General Stephen Kearney, Fremont sided with Stockton. Stocton promoted Fremont to military commandant and civil governor of the Territory of California in 1847. In this capacity, Fremont saw Mexico accept the articles of capitulation ceding possession of the territory to the United States. But General Kearney did not forget Fremont's decision to side with Stocton, and in 1847 Fremont was tried by courtmartial in Washington. He was found guilty of insubordination charges. Fremont had purchased a large tract of California land in 1847. When gold was discovered in California, Fremont's land was suddenly worth a fortune, and he soon became a very wealthy man. 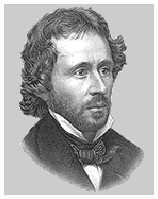 In 1850 John Fremont became one of the first two senators from California. After serving a term, he began his last expedition through Utah, Nevada, and California. He returned and re-entered politics, becoming the first presidential candidate for the Republican Party. He lost to Democrat James Buchanan. In 1861 when the Civil War began, Abraham Lincoln made Fremont a major general and commander of the Western Federal Army. When he went back to civilian life, he enjoyed financial prosperity during the railroad construction booms of the late 1860's, but by 1873 he met with financial disaster. President Hayes appointed Fremont as territorial governor of Arizona in 1878. John Fremont died in New York state in 1890, having lived a life full of immense successes and unimaginable setbacks, a life of exploration, adventure, and discovery. Fremont's extensive journals and maps can be found in some college and large city libraries as the four volume set The Expeditions of John Charles Fremont. But if you want to own a very highly acclaimed biography and reference, you should click here and buy Fremont: Pathmarker of the West by Allan Nevins. It is a detailed and accurate classic originally published in 1939, and reprinted in 1992, well worth adding to your library. Copyright � 1998- by NSTATE, LLC. All rights reserved.